As the Summer Sun Celebration nears, Twilight Sparkle is sent to Ponyville: a small, out-of-the-way town which is definitely inhabited by ponies just like her. It's right there in the name. After an enlightening discussion with Ember, Thorax springs to action to unify the changeling race. One particularly tense encounter with a group of renegades later, Thorax returns to Ponyville to discuss current events with Spike... and he has a couple of burning questions for the young dragon. Two decades after the banishment of Nightmare Moon, her shadow still lingers. Princess Celestia has been left to tend the Twin Thrones alone and protect us all from those who would see Equestria crumble. Our enemies take many forms: some would tear the world down with their claws, others with their smiles. They are monsters all the same. I have had many names, and I have been many things. Today I am Swift Sweep, and I work for the Equestrian Bureau for State Security. NCMares (DeviantArt) for the gorgeous cover art. Octavia Harmony: primary beta reader and editor throughout the many months of production. PaulAsaran: for great help with and feedback on plot development and initial story drafting. Kleora, Cerulean Voice, Nonagon: for further help with editing and story development. For Twilight, being the Princess of Friendship gets overwhelming sometimes – there are simply too many royal duties she must attend! She just can't seem to shake a feeling of exhaustion. Things used to be so much simpler. In the magical land of Equestria, ponies speak of great heroes and greater adventures, of foes overcome, and of hardships bravely faced. This is not one of those stories. Sometimes, a mare is just a mare. Yet, just sometimes, even an unremarkable footnote of history might be worth listening to. Princess Luna loves her little ponies, be they old or young -- and on the night before the new year's dawn, she takes the time to visit a jaded old mare. Because even a pony in the twilight of her days deserves help, whether she will admit it or not. Originally written for a contest back in 2013. Our kind has it that the life of a queen is the happiest, for they are blessed with the shortest time in this world. A mighty queen will be remembered for eternity, forever residing in the hearts of her people. The greatest tragedy a queen can suffer is to be forgotten – to be stricken from history. I refuse to bend before oblivion. As discussed in the Royal Canterlot Library. Featured in the Royal Guard. 100% approved by Twilight's Library. Like shipping? Hate reading? Look no further! Everybody's favourite small horse-related romantic relationships, in a thousand words or fewer. This follows canon up to the end of season 2. Check out the Fanart Repository for lots of awesome Night Shift art! Winner of Stories Back from the Read 2013. 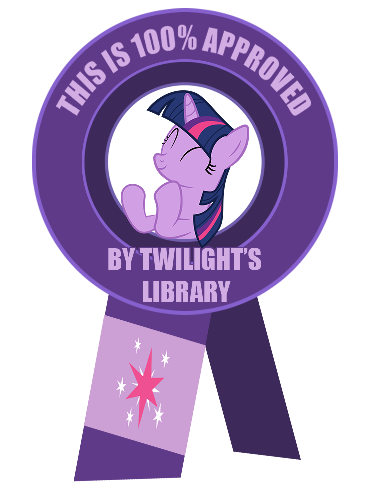 One hundred percent approved by Twilight's Library! Special thanks to Nonagon and Wise Cracker.